As an independently-owned brewery, we can tell you unequivocally that it is impossible to sell a beer for a dollar without compromising quality. So, we’ve decided to respond to Ontario’s buck-a-beer challenge in our own way – by inviting our customers to help refugees build a new life in Ottawa. As our contribution, we’re donating $1 for every can of our Dominion City Buck-A-Beer Blonde Ale to support refugee integration efforts in Ottawa. 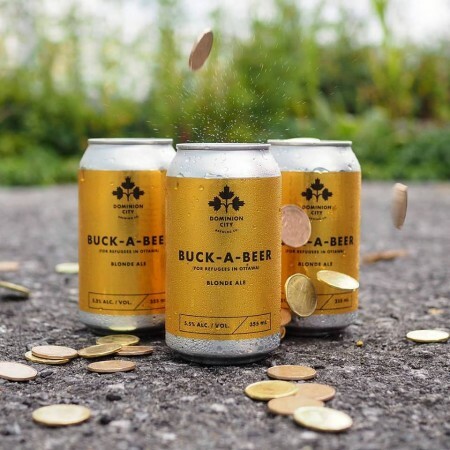 Buck-a-Beer (For Refugees in Ottawa) will go on sale today for $3.55 per 355 ml can at the Dominion City retail store and online shop, with more than a dollar from each can sold going to local refugee welcome groups. The launch will be celebrated with Syrian falafel and Damascus-style pizza from Délices de Damas that will be available at Dominion City starting at 11:00 AM.